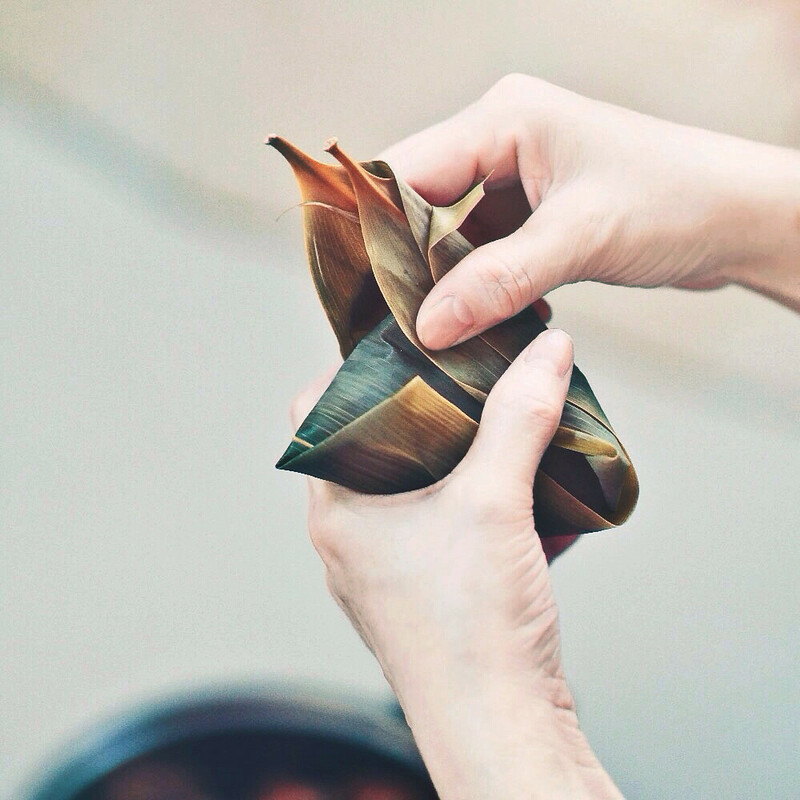 (肉粽), also known as zong zi (粽子), it's mostly just for fun so we've never tried to perfect the recipe, our dumplings taste different every year, depending on the ingredients we choose to include each time (dried shrimps/red bean/char siu/scallops/etc). This recipe was passed down by my grandmother and I heard she was really strict. 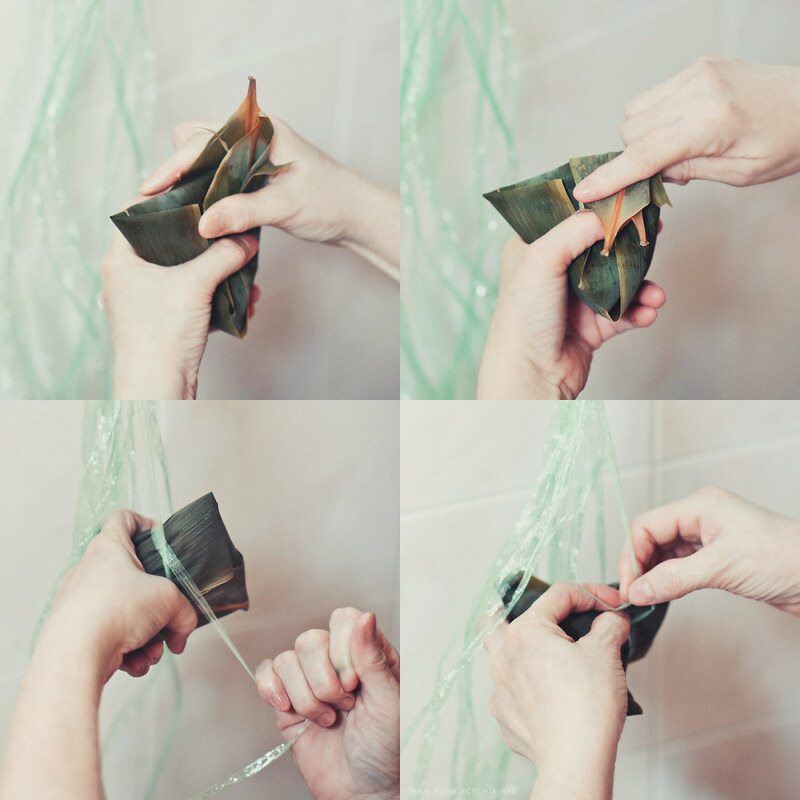 She didn't allow my mum to work with glutinous rice until she could perfect the wrapping with sand. I made a bunch of bak zhangs of squares and rectangles when I was young.. luckily my mum didn't disown me hehe. 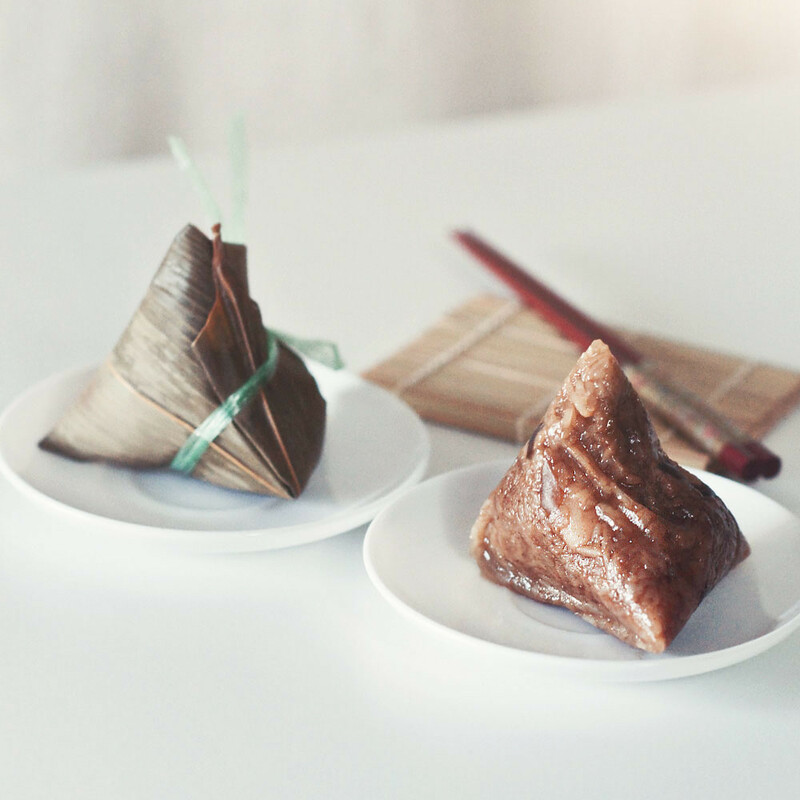 There are many types of rice dumplings but since my family makes the salty pork rice dumplings more often, I'll write the step-by-step process of a simple, easy-to-make recipe where everyone can try at home. Please note that all amounts are approximate, making rice dumplings is experimental, you have to taste and adjust as you go along. 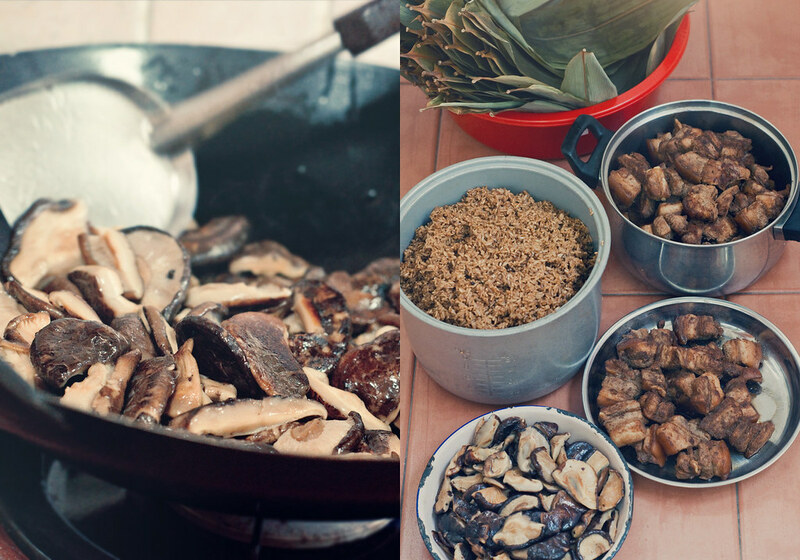 The aim of this post is to give an idea of how to make a simple bak zhang so our filling ingredients are only pork and chinese mushrooms but you can definitely add other ingredients such as chestnuts, salted egg, chinese sausage/etc to your preference. 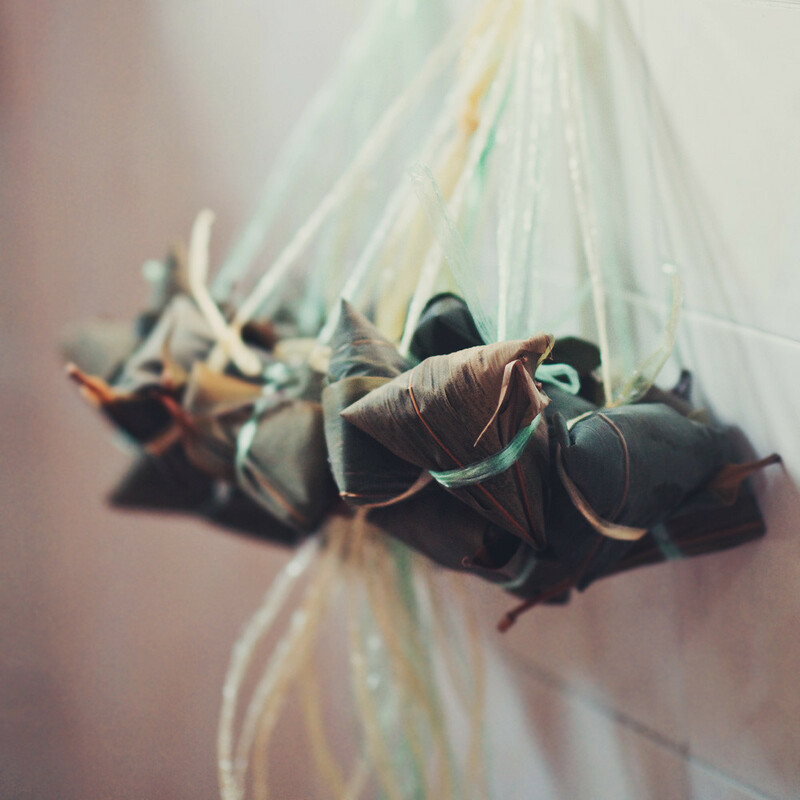 Soak the bamboo leaves in a large pot of hot water, make sure the leaves are submerged in the water, you can use plates to weigh them down. Soak the Chinese mushrooms in cold water, dry them when they become soft and cut them into slices. Peel and dice the shallots and garlic, we use the food processor so the dicing is done fast in few seconds. Heat 1 tbsp corn oil in a pan/work, fry the chinese mushrooms until they become slightly brown, add a pinch of salt for better tasting. Remove from pan and transfer to bowl. Using the same pan, add 1 tbsp of corn oil and fry shallots and garlic till fragrant. Add in the pork belly chunks and fry until they're slightly brown, do not fully cook the pork belly, add in the remaining ingredients, toss and sear them briefly. Add salt/sugar/dark soya sauce/etc as you go to achieve your preferred taste. Remove the pork belly from pan and transfer to bowl, leaving the gravy inside the pan. Using the same pan with the pork belly gravy still simmering inside, add in the remaining shallots and the glutinous rice and stir thoroughly. Add in remaining ingredients and stir till well mixed. Taste (but do not eat it because rice is still raw), add salt/sugar/dark soya sauce/etc if necessary. 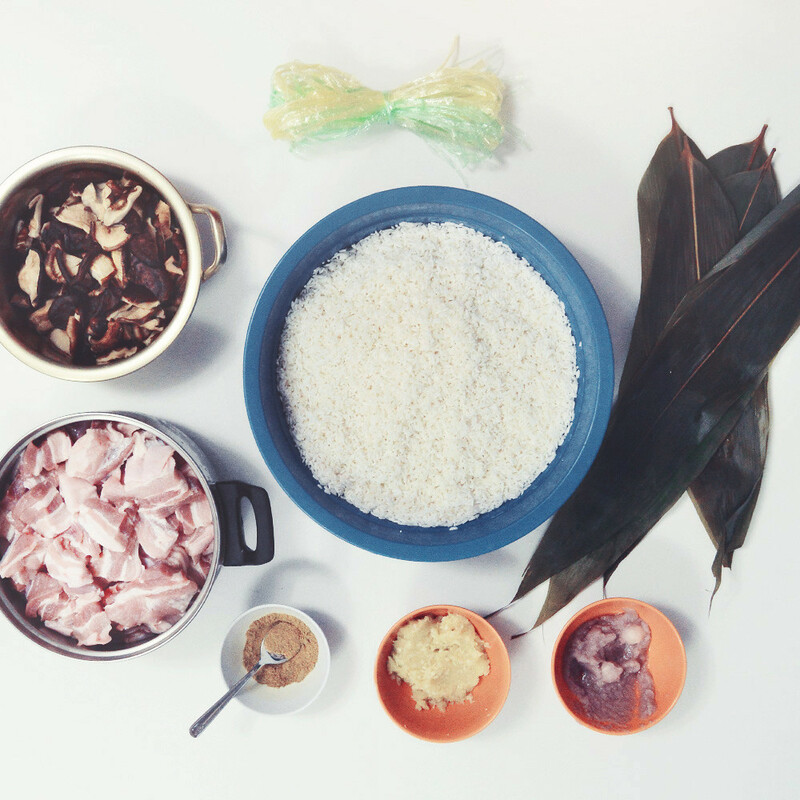 Note: It's ok to have the rice more salty as the water will dilute the taste a little during the cooking process afterwards. Switch off the flame and transfer rice to bowl. 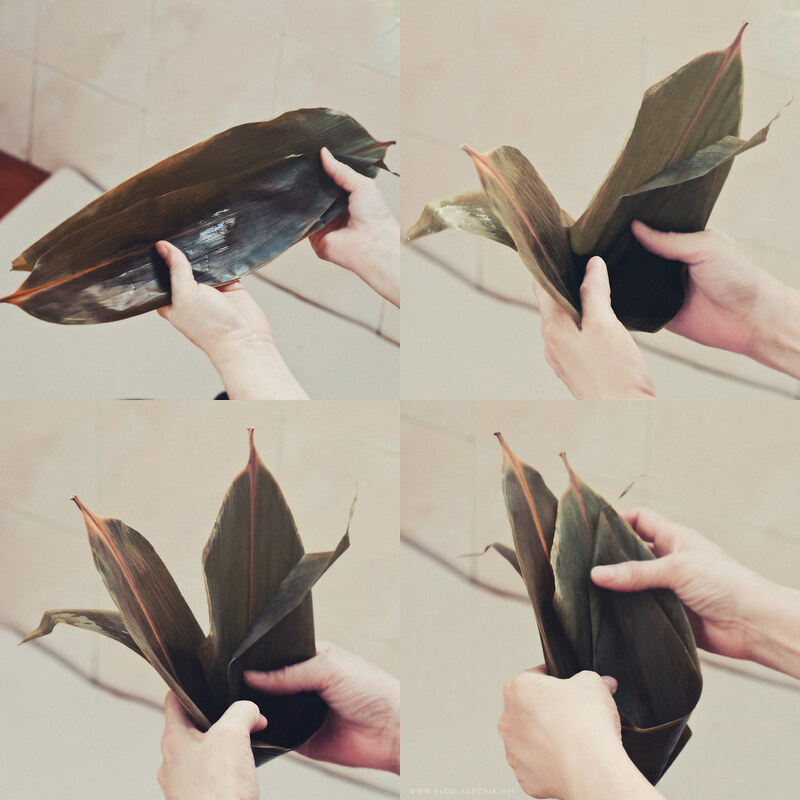 Transfer the bamboo leaves into a clean bowl and drain the water, it's okay if they're slightly wet. Choose two leaves, 1 big and 1 slightly smaller. Place the smaller leaf on top of the bigger leaf and in opposite directions, also make sure the smooth side is facing up. Do not use any leaves which have holes or have potential of tearing as they might tear open during the cooking process. Form the leaves into a cone. Place each of your filling ingredient atop the rice, our choices are quite limited so we're going to put 2-3 chunks of pork belly and 2-3 slices of chinese mushrooms. 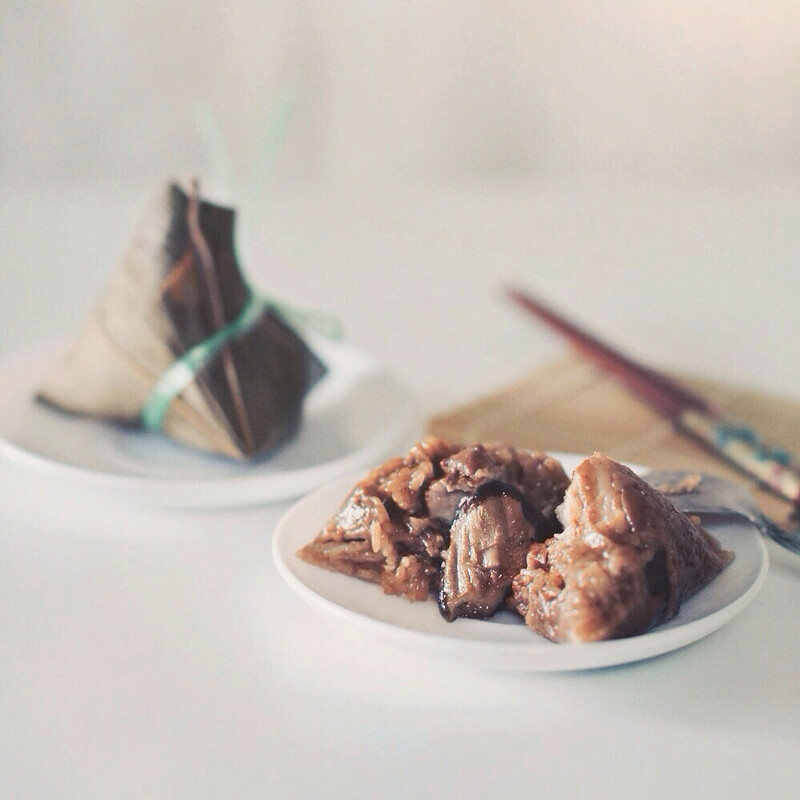 You will probably have chestnuts, salted egg, chinese sausage and other fillings to add so don't put too many of each in 1 bak zhang. Top it off with more glutinous rice. 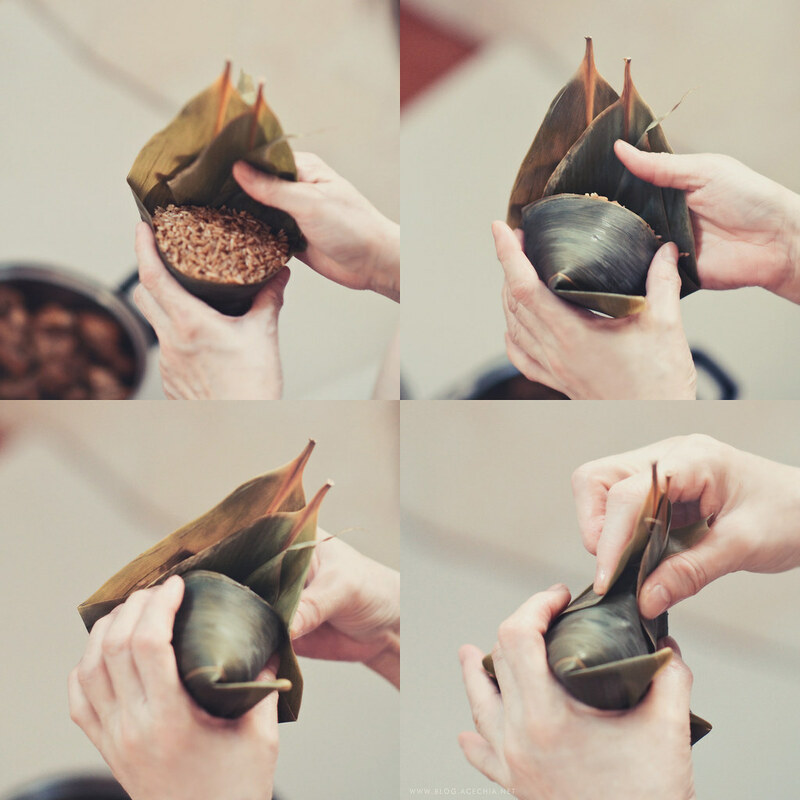 Make sure it is not overloaded with glutinous rice as it can make the wrapping quite difficult. Press the edges down with two fingers and slowly knead it into a triangle shape. Fold the tips down and secure with cooking strings/hemp leaves. Don't worry if your bak zhang looks out of shape, just keep trying and you will nail it. Wrapping takes years to perfect, I've been wrapping since young and my bak zhangs still look wonky at times! 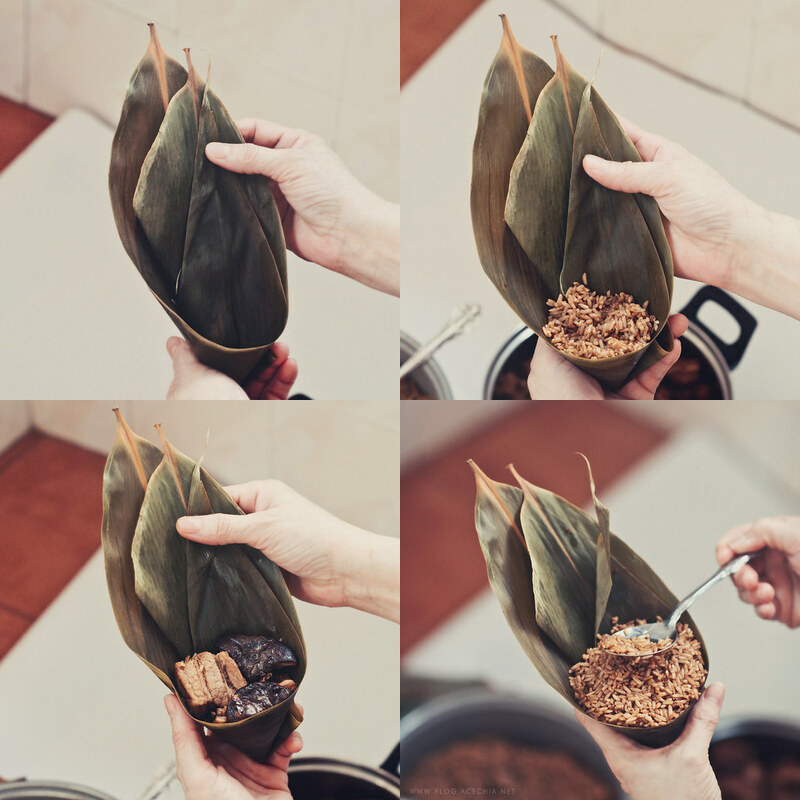 Repeat the process with remaining leaves and ingredients, until everything is more or less used up. Boil water in a large pot in advance. When the water starts boiling, lower the bak zhang into the water and make sure the whole bundle is fully submerged in water. Cover the pot with a lid and cook over medium heat for 1 hour 30 mins. 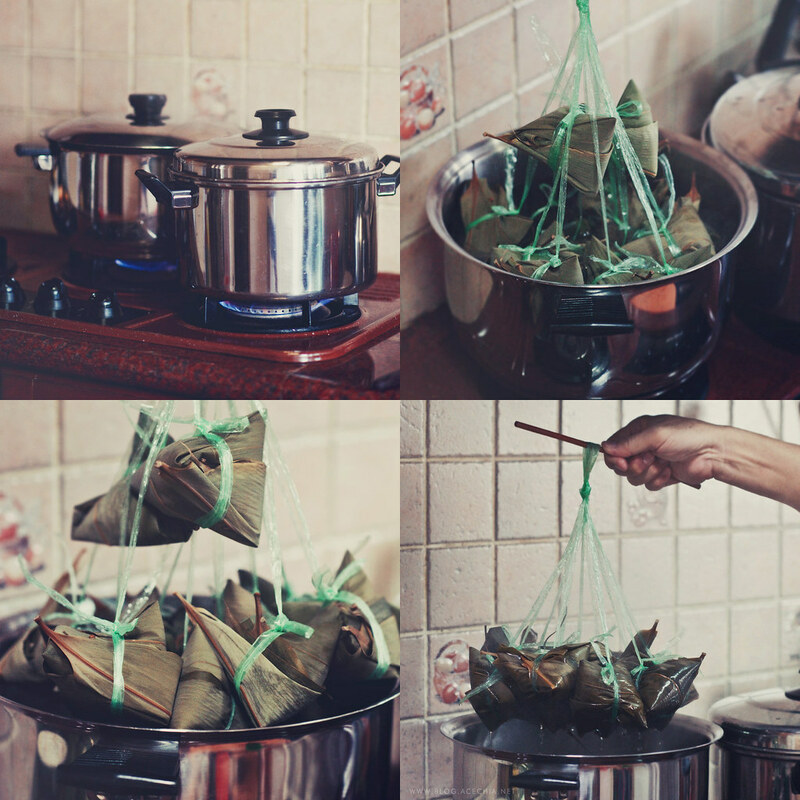 We used 2 pots at the same time (1 bundle of 12 bak zhangs for each pot) Normally, we make about 4 bundles. Unwrap one to check if they're cooked and try the taste. Once they are cooked, remove from pots and place in colander to drain away extra water. 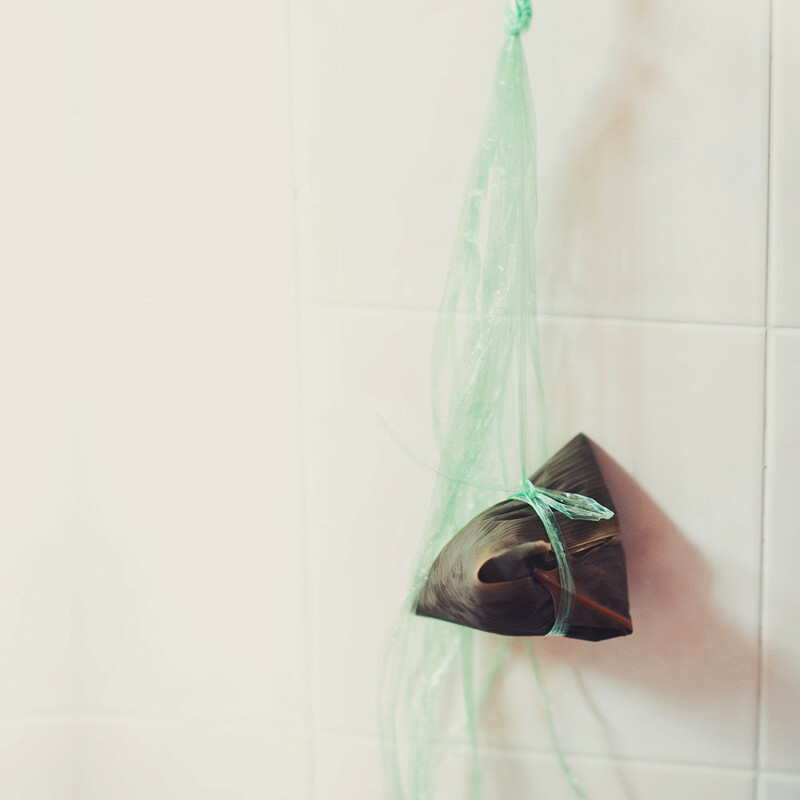 You can also hang them up but make sure there are basins below as they will be dripping all over.